I do not have a lot of stitching to show today. While cleaning out the attic I found this piece that I did many years ago. It still has youngest son listed as Chuck( he is Charles now) so I am thinking I did this back in the 1990s. I took it downstairs and hung it above the bulletin board in my back hallway. Here is one of the patriotic pieces I have been working on. 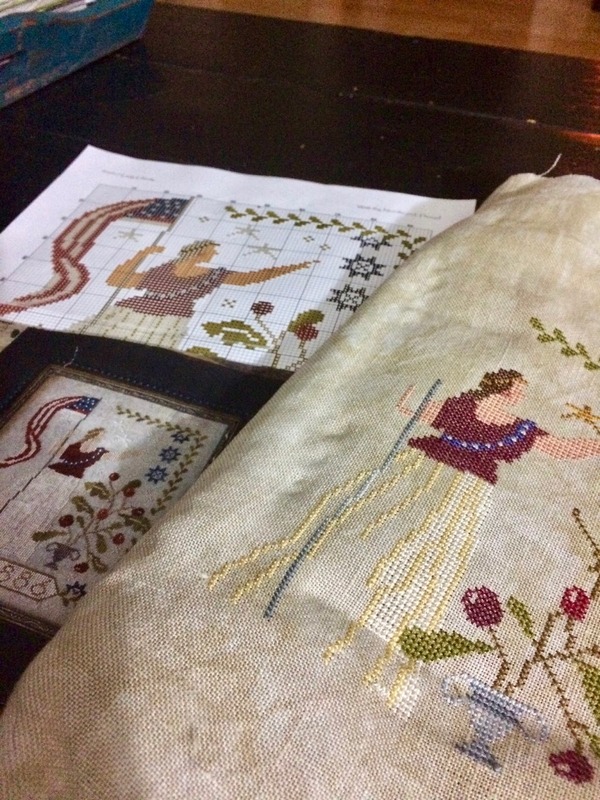 It is a Brenda Gervais pattern called Lady Liberty. I am going to display her with my other patriotic stitches. Some people complain about "color" patterns but I am liking them as I get older and my eyes are not what they used to be!! Today I am getting out my Prairie Schooler village but with all I have to do today, it won't get much attention. I will be making cheese straws and a pound cake for my Book Club which meets here on Monday morning. Landon and I are working on a little stool that he wants to give to Audrey. It belonged to him when he was little and now that he is a big boy he wants to pass it along to his baby cousin. I hope everyone has a Happy Mother's Day. As I told one of my sweet friends, you may not be a biological mama but you have touched many lives and are a mama of the heart. 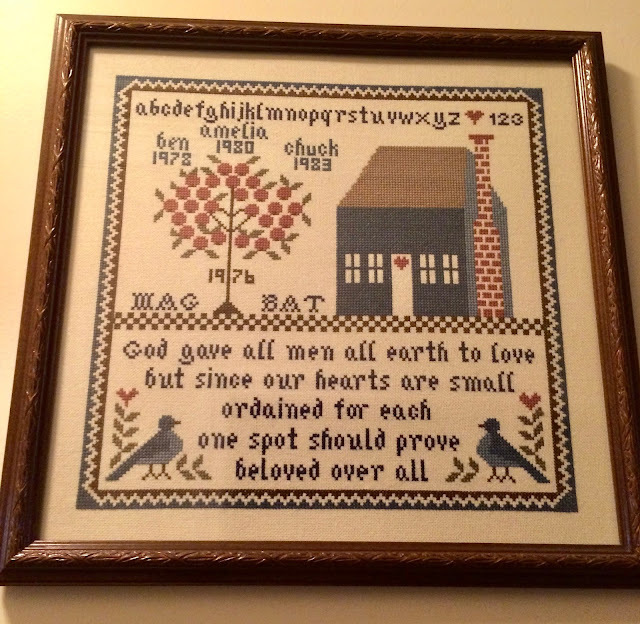 Good Morning, Always fun to see your cross stitch pieces. It sure looks like rain here in north GA this morn. It was always easier for me to stitch on sunny days! How sweet of Landon to gift his stool to little Audrey. You'll have to share with us. Best wishes with baking your treats for the book club meeting. I love the lady liberty piece. It is going to be so pretty. The other one is great too. I am glad you could find a place for it. I guess we should find one place to rotate our old ones into every month or so. I love weekends with lots of interesting things to do. Happy Mother's day my friend! Hugs! How fun to uncover that piece from the 90s! Your patriotic project will be beautiful! I'm sure the baking will go well and your book club will be well fed on Monday! Happy Mother's Day to you tomorrow! Love the project. Very special for me. In the library I found a book with very old embroideries. I think you should love it!!! I would think that the color pattern would be easier for everyone. Excited to see your finished Patriotic piece! I really enjoy your cross stitch. So sweet of Landon to share his stool! Always enjoy your cross stitch projects, Arlene. Have a wonderful Mother's Day.